This has been the summer of the crab. There has been hammering and cracking galore. My friend got a bushel of crabs to celebrate his birthday- my new birthday celebration of choice. 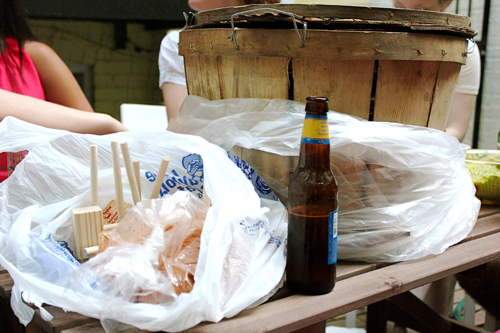 We had everything you need for crabs: mallets, beer, good friends, and extra Old Bay. 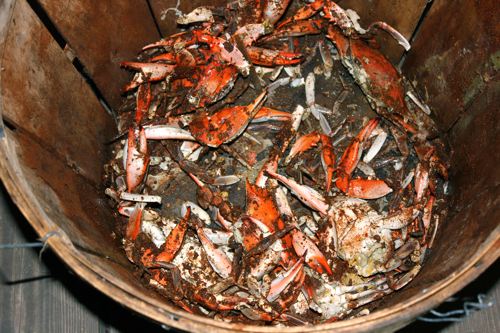 It turns out that a bushel of crabs is a feast. 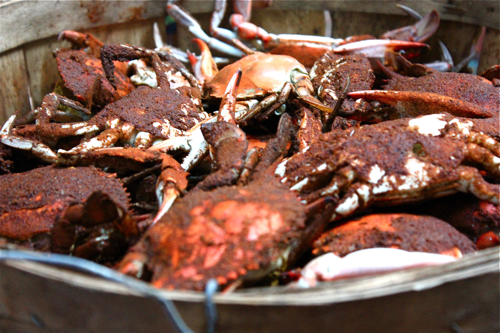 According to the Internet, a bushel can hold 5 to 7 dozen crabs. We we ready to dig in! We spread out some newspapers, dumped the crabs, and grabbed the first ones we could. Not everyone was used to cleaning their own crabs. Up until this summer, all of the crabs I’ve eaten in my life (there have been many) have been cleaned for me by restaurants or my crab-mastering aunt and uncle. But the birthday boy was a pro. 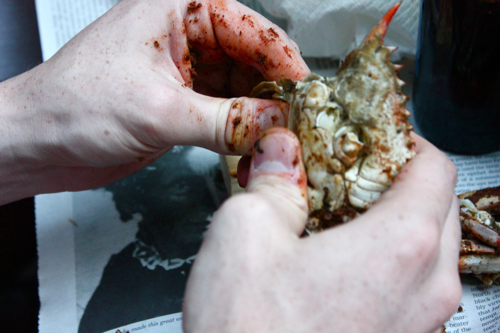 Crab eating is a notoriously messy endeavor. 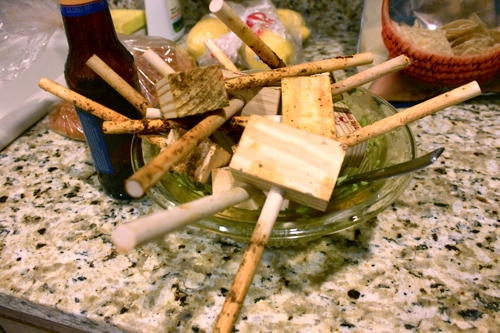 Our mallets and fingernails were crusted with Old Bay. Manicures were sacrificed. 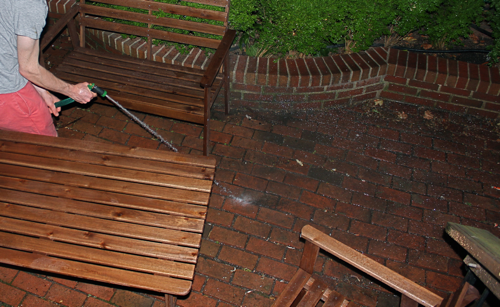 Even the patio needed to be hosed down. We probably did too. It takes a gracious host to allow en masse crab eating at her house. There were plenty of crabs left over from the feast, and I was lucky enough to take 2 dozen home. Little did I know that carrying 2 dozen crabs in a plastic bag through the city and on the metro is very dangerous. The claws and spines went right through those bags. One very good friend walked a little too close to my bag and ended up with a bloody gash on her leg (still so sorry!). I got spiked through my jeans many times. And rushing to get through the metro gates in time to catch an idling train proved nearly fatal when one crab stabbed me in the belly button! All in all, we did a pretty good job chowing down on the crabs, and I can’t wait to do it again. 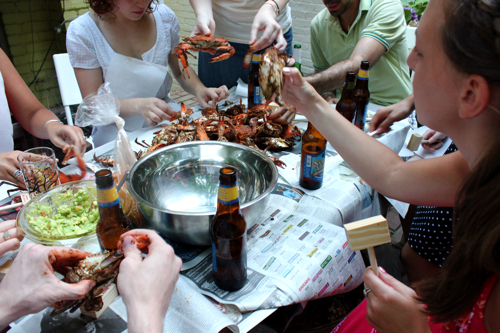 Now, I just need to find an adequate outdoor space so I can have a bushel of crabs at my birthday too!